I am showing here a Wedding Dress made to order for a very elegant relation of mine – Sile Walsh. This Organza Over Dress (1950 style full skirt), with Gold Lurex Thread Detail, and Dutchess Satin under Dress was beautifully made by her Mother Sheila Walsh. With Sheila making the dress and I drafting the pattern we completed a very elegant Romantic Style Dress which we were both pleased with. 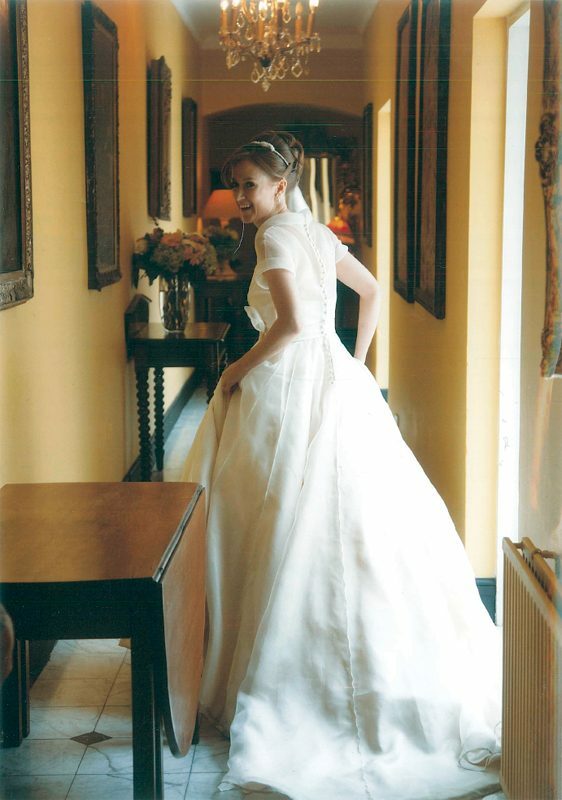 Sile is shown here wearing her dress in her family home and looking stunning shortly before her wedding. I usually Design for both Contemporary Mother Of The Bride and the Red Carpet Dress – but this was a Wedding Dress with a difference.